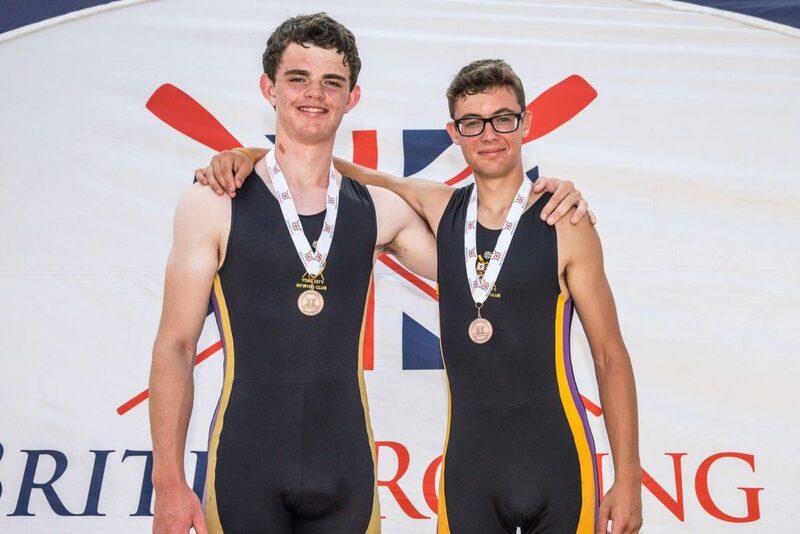 Gold and Bronzes at the British Rowing Junior Championships 2018. 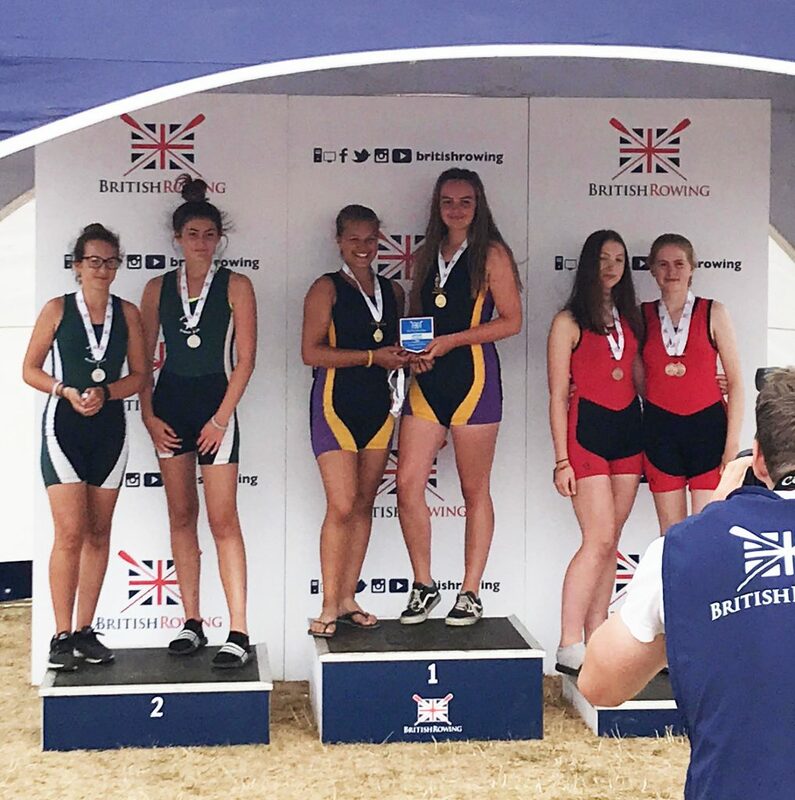 YCRC had a fantastic weekend at the British Rowing Junior Championships Held at the National Water Sports Centre, Nottingham on 19th-22nd July. YCRC sent a strong squad of 28 young athletes to compete over three days of competitions, athletes who secured an impressive haul of three medals and high placings across the weekend. WJ142x (Eliana Soma (Str) and Daisy Jackson) take to the water for the BRJC 2018 omnium. Photo: G. Jackson. On the Friday of the event, the youngest athletes took part in the ‘omnium’, a challenging list of skills and manoeuverability tests that would strike fear into the heart of many adult rowers, including standing up and turning around completely in a finely-balanced single or double sculling boat, capped off by a 500m sprint race. 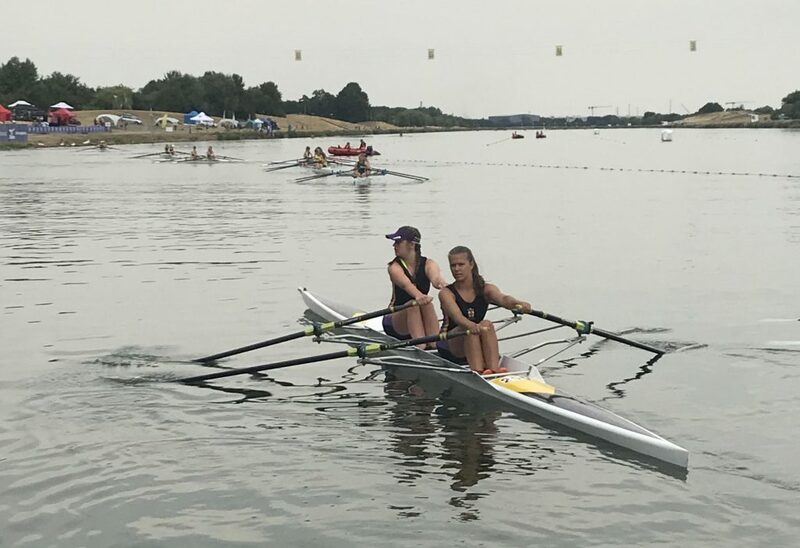 The WJ14 double scull of Eliana and Daisy stormed through their 500m race to clock the fastest time of 62 crews in the event – when this was added to the points from the skills tests, they had secured their gold medals! There was also depth in the YCRC strength, with a Lucy and Eleanor claiming tenth in the same event, adding to the gold and silver medals, and three top ten finishes that YCRC have had in this event over the past three years, and in the J141x, Sam placed a fantastic 10/76. Eliana Soma (l) and Daisy Jackson winning gold in the BRJC 2018 WJ142x omnium. Photo: G. Jackson. This strength was also evident in the side by side racing over 2 km by the older athletes, with YCRC crews performing well across the board. Both Charlie (WJ151x), and Olivia and Tamsin (WJ162x) both won their ‘C’ finals to come seventh overall. After a late substitution due to injury, the WJ154x- of Caitlin, Alannah, Zetta, Eliana and cox Lily still managed to reach their D final. Similarly, the J184x- who had performed so well at Henley Royal Regatta also had injury issues, and a younger sub on board, but Alfie, Josh, Aiden and Frank lead their ‘B’ final from the start, winning it by clear water over the other crews. Tom Mills (l) and Gonzalo Briones win bronze at the BRJC 2018. Photo: British Rowing. In the J15 2x, Tom and Gonzalo excelled, pushing past a Leander crew to reach the A final in third place. In the final, they overhauled a length deficit at 500m to take bronze by just 0.01 second, showing that it pays never to give up until you’re over the line! 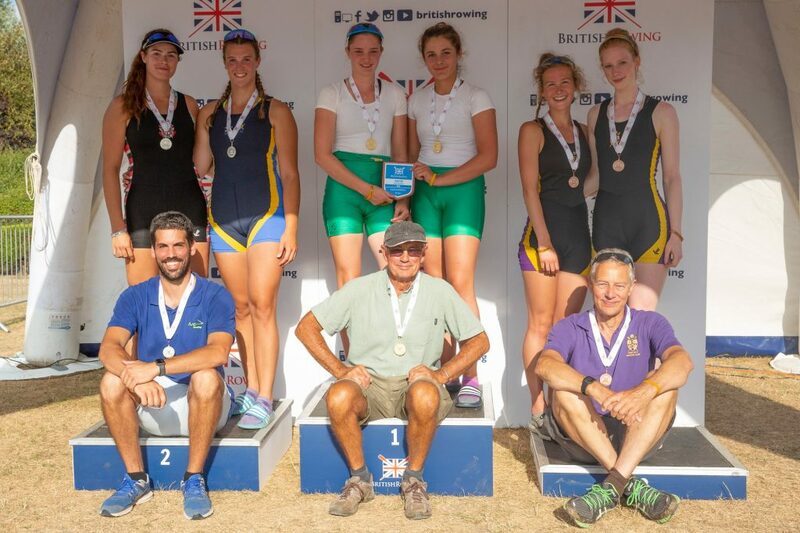 In the WJ18 2x, Lucy and Katarina finished their phenomenal year, and their junior careers, on a high – after being losing semi-finalists at Henley Women’s Regatta a few weeks ago, they too secured a bronze medal, losing out on silver by only 0.5 second in a hard-fought final. Katarina Bonner (l) and Lucy Edmunds winning bronze in the WJ182x at BRJC 2018, with coach Jamie MacLeod. Photo: British Rowing. The strength and depth of the YCRC junior squad is a testament to the hard work of the juniors themselves over the year, through rain and shine, and to the work of their coaches and supporters – they should be very proud of their achievements that have brought may wins this year, including those at the national level. For those who these races were their last as juniors with YCRC we wish all the best for their future rowing endeavours on or away from the Ouse!